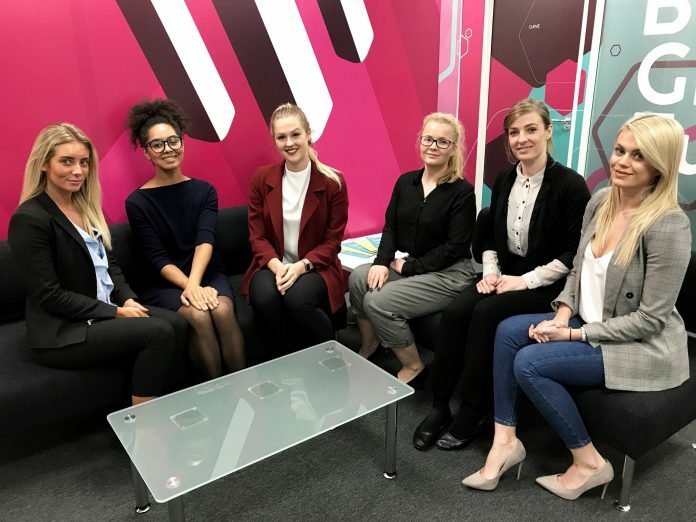 (L-R) Tia Billinger, Emily Bodden-Burton, Amy Frost, Claire King, Steph Smith, and Holly Farmer have joined Macildowie at its new headquarters in Nottingham. A number of new appointments at Midlands-based recruitment consultancy, Macildowie has capped the end of a strong quarter of growth. Cassie Mallon has joined as a divisional manager to lead the HR recruitment team in Nottingham and Derby. With more than 11 years of experience in the recruitment sector, Cassie will form the final piece of the 14-strong management team. The company also moved closer to its goal of a total of 100 employees by the end of 2019, recruiting a further 13 recruitment and trainee consultants. The company now employs 85 across its offices in Nottingham, Leicester, and Milton Keynes. The recent arrivals at Macildowie’s new Nottingham headquarters are consultants Tia Billinger, Martyn Kingsbury, and Jeanette Spicer, trainee consultants Emily Bodden-Burton, Steve Haworth, Claire King, Amy Frost, and Holly Farmer, and business support administrator Steph Smith. Joining the team at the company’s offices in Leicester and Milton Keynes, will be recruitment consultants Kate Oliver, Annabel Patel, and Lauren Smith, trainee consultants Ross Abrahams, George Neyland, and business support administrator Natalie Widdowson. James Taylor, Managing Director of Macildowie, explained that the new arrivals will allow the company to continue to its growth. He said: “We’re delighted to have our management team in place, it has been a big investment and gives us the platform to execute our strategic objectives and achieve our ambitious growth plans. Over the previous two years we have recruited a wealth of experience into the business. Now we have created such a strong platform and culture, we envisage that the majority of our recruitment will now be in graduates and trainee consultants.